If you’re hankering for an explosion of colour at DesignerCon, then look no further than the booth of our good friend Mr Mars Studios! One of the nicest guys you’ll meet at DCon next week. Super solid. Mega talented too. 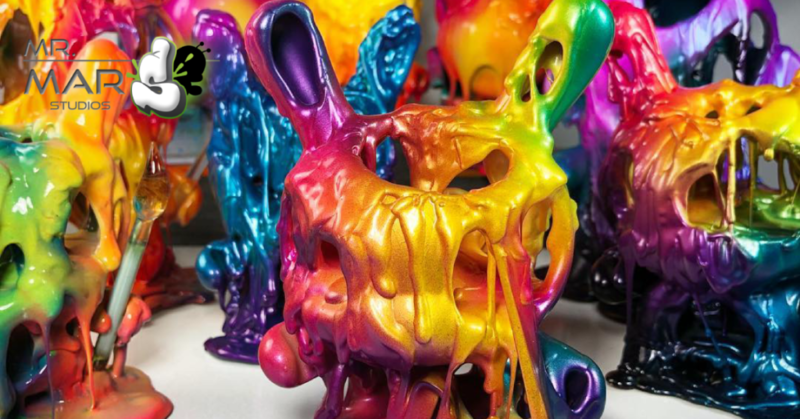 Creating these combustion art pieces from Kidrobot Dunny/Munny and grafitti cans. A true melting of styles. Marshall, as we like to call him, will be bringing himself & his art to DCon! You’ll be able to find Mr Mars Studios and his awesome array of colours at DCon Booth #843 from next Friday evening throughout the DesignerCon weekend! Go say hi, buy some explosive shizzle from him and tell him The Toy Chronicle sent you! You’ll need to first buy a ticket to DesignerCon, if you have yet to do so, grab one HERE! You can find Mr Mars Studios on Instagram HERE!